The CODATA Prospectus: Strategy and Achievement, 2015-2018 summarises the most important activities, deliverables and impacts over that period: https://doi.org/10.5281/zenodo.2559274. Turning FAIR into Reality https://doi.org/10.2777/1524, European Commission Expert Group Report, chaired by Simon Hodson, Executive Director, CODATA. SA-EU Open Science Dialogue Report https://doi.org/10.5281/zenodo.2559469, Report of the SA-EU Dialogue, Simon Hodson, Executive Director, CODATA, was a member of the Expert Task Group. 2018 saw a significant milestone in the history of science when the General Conference of the International Bureau of Weights and Measures approved the redefinition of four base units of the International System of Units (SI) on values determined by the work of the CODATA Task Group on Fundamental Physical Constants. The CODATA Data Science Journal continued its renaissance with rapidly growing citations and impact. 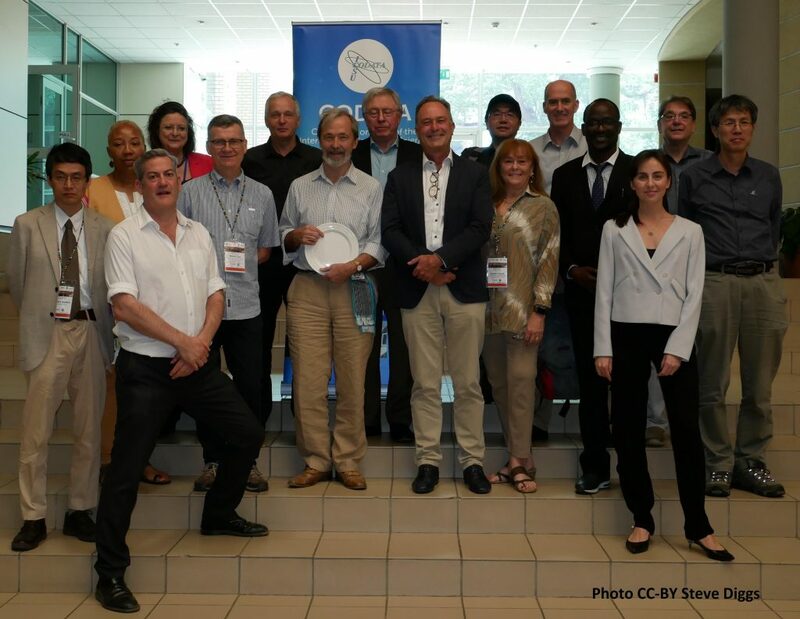 Two notable new Special Collections include Research Data Alliance Results and papers from the Göttingen-CODATA RDM Symposium 2018, which took place in March 2018.
International Data Week 2018, which took place in Gaborone, Botswana, 5-8 November, organized in partnership with the Research Data Alliance, the ISC World Data System and the African Open Science Platform was a major success with 850 participants from around the globe. IDW combines SciDataCon with the RDA Plenary. Papers from the conference will appear in the CODATA Data Science Journal. The event held at the Schloss Dagstuhl in partnership with the Data Documentation Initiative was particularly important in advancing the initiative’s approach and it will result in a series of articles about the pilot case studies and the data challenges involved. CODATA is preparing for consideration by the International Science Council, a proposal for a major flagship programme to address the challenge for data interoperability and integration for interdisciplinary research. The African Open Science Platform project addresses a number of areas essential to building capacity in the use of data and Open Science. Information on the project’s activities can be found at http://africanopenscience.org.za/. Two stakeholder and strategy workshops (March and September 2018) led to the launch of the Vision and Strategy for the African Open Science Platform https://doi.org/10.5281/zenodo.2222418 for the African Open Science Platform at Science Forum South Africa, in a presentation by co-chair Khotso Mokhele. A founding members’ meeting will be hosted at the Biblioteca Alexandrina later in 2019. The CODATA-RDA Schools of Research Data Science have continued expanding: in 2018 schools were held in Brisbane, Australia (June; short version); Trieste, Italy (August; foundational school and advanced workshops); Kigali, Rwanda (October; foundational school) and São Paulo, Brazil (December; foundational school). For 2019, Data Schools are planned for Addis Ababa, Ethiopia (July), Trieste (August), Kigali (October), San José, Costa Rica (December) and Abuja, Nigeria (TBC). Negotiations are underway with hosts for 2020 and, resources permitting, that year could see as many as twelve schools. A video about the Data Schools initiative can be watched at https://vimeo.com/299263596; be sure to follow the CODATA website, lists and social media for announcements of application deadlines. Building on this work, CODATA is a partner in the European Commission funded FAIRsFAIR project, playing a major role in the development of virtual competence centres for data skills. CODATA is also leading the GO FAIR Training Frameworks Implementation Network which will leverage these activities to 1) refine a curriculum framework for data science and data stewardship; 2) develop a train-the-trainer programme; and 3) design a mechanism for endorsement and certification of training activities. The General Assembly elected Barend Mons as President and a new Executive Committee. Eight Task Groups were approved. Also significant was that the General Assembly approved revisions to the CODATA Constitution designed to encourage organizations of various sorts to become CODATA members and to allow CODATA to function in a more effective, modern way. In addition to the activities noted above, CODATA will convene two major conferences in 2019. The Call for Sessions has been released with a deadline of 15 April 2019. The conference will follow a high-level workshop, 16-17 September 2019, on ‘Implementing Open Research Data Policy and Practice’ that will examine such challenges in China and elsewhere in the light of the emergence of data policies and in particular the China State Council’s Notice on ‘Measures for Managing Scientific Data’. This entry was posted in Uncategorized on February 11, 2019 by codata_blog.